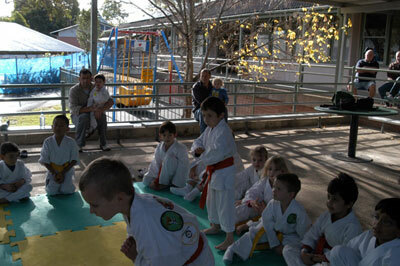 Kids learn martial arts in different ways. It is the instructors job to discover how best to reach a child. I’ve spent the last two decades teaching martial arts to children. There have been many days when I got in my car after class, and said to myself, “I don’t think I reached anybody today”. Other days I drove home with a beaming smile on my face, knowing I made a big impact that day on the life of a child or two. Luckily those kind of days outnumber the others. Here are some of the lessons I’ve learned about teaching martial arts to kids. All kids learn at a different pace. Some students pick up the technique the first time you show it to them. Other students might require you to explain it ten times before they understand. This does not make them stupid. People just differ in the way they process information. I am a slow learner, for example, but once it is in my “hard drive”, I very seldom forget it. Many fast learners I know are not able to retain information like I do. We all have our gifts. All kids learn in a different way. In a class of twenty children, most will learn visually. That is, by watching. You show them a move, they watch, and they learn best that way. Another group, usually a smaller number, will hear instructions and pick it up that way. They are audio-inclined, and learn best by sound. Still another group will have a difficult time with visual and audio instructions. They are tactile-oriented. If you lift their foot and place it in the proper position for a kick, and actually take them through the motion of the move, they will pick it up. A good instructor will be sensitive to the different ways in which children learn. If you are having difficulty reaching a particular child, often times their mother or father can shed some light on the best way to reach them. There are many ways of doing the same technique. There is no wrong or right in many cases. For example, there are two ways of throwing an axe kick. It might be done straight up and down, which is the traditional way. It may come up in an arcing motion, like a crescent kick. The way in which the student feels the most natural is the correct way for them. There is no black or white in this area, unless the student is doing a move in an unsafe way. If you are patient enough, every child will get it. Never give up on your students. As we saw above, students learn at a different pace. You must encourage them until they understand the movements of any particular technique or kata. If you give up on them, it sends a message that it is okay to give up. You must walk the walk if your students are to follow your example. If a child is late to class, it is probably not their fault. Children don’t drive cars. They have little control over when they get to class. I have heard stories about instructors making kids do push-ups for being late. That is just plain wrong. Just let them bow in and join the class. If you are doing something with fast moves, like high kicks or sparring, they should warm up first. Also please read my post on exercise as punishment. Recognition and praise is the best motivator. I have learned that praise and recognition is the most effective way to get results. Kids and adults respond best to recognition. Gifts or other material objects only produce very short-term results, and send the wrong message in many cases. We should strive to do what is right, not what will result in our obtaining a reward. The sensei sets the tone for the entire club. By treating people with kindness and respect, you will create a club that attracts people who value those qualities. By the same token, if you show no tolerance for lack of respect amongst your students, you will repel disrespectful people. I am okay with that. What lessons have you learned about martial arts for kids? Set the bar high for your karate students. They will always rise to the occasion. In karate class this week I said “Today we are going to learn how to throw a combination with 16 hand strikes in it, and we are going to do it with speed and power”. I saw the looks of “no way” and “unbelievable” on their faces, and heard the sighs of disbelief as I explained how this drill could greatly improve their hand speed. I asked them “how many of you can do it?” A few hands came up. I told them all to put up their hands, because “you will all be able to do it, I challenge you to do it”. First, I showed them four different combinations and we drilled them over and over. Many of the students had trouble with it, but with patience and determination, we were able to get the combinations down pat. We then strung two combinations together for a total of seven strikes. We had difficulty at first, but overcame it with practice. Again, many of the students were unable to do it, but we forged ahead, adding three more strikes for a total of ten. I could hear the sighs growing louder and the groans of exasperation by now, but we were on a mission. As we completed the ten-strike combination, I noticed a funny thing. The students who earlier had trouble with the 7-strike combination were doing it easily, now that it was the first part of the 10-strike combination. The “impossibility” of the 10-strike combination made the 7-strike combination seem easy. By the time I announced to the class that we were now going to attempt a 16-strike combination, I could swear I was starting to get dirty looks from the parents, who were watching from the side, and the class seemed to all but give up, save for a few determined individuals. The 16-strike combination concluded with a 6-punch boxing combination we had practiced earlier. It was now just a matter of tacking it on to the ten-strike combo. The students struggled and many were not able to get it, but I could see the determination on their faces. We kept practicing. As we progressed, just about everyone had mastered the 10-strike combination, and most had done pretty well on the 16-strike combination. We finished, pumping with energy, and bowed out with a feeling of great accomplishment–a truly special karate class. The moral of the story: set high standards for your students, keep raising the bar, and expect them to be able to do it. They will rise to the occasion. Challenge yourself and challenge your students. How old were the students, you ask? Get ready for this—6 to 10 year olds. 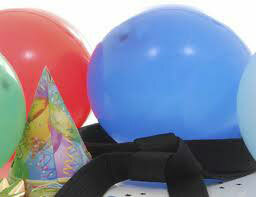 Martial arts classes for kids should be fun, safe, and interesting. Parents and children should feel welcome. Retaining your students is one of the most important things you need to do as an owner of a martial arts school. Advertising is not cheap. It is much more expensive to recruit new students than to retain your existing ones. Word of mouth advertising is your most powerful weapon, and your existing students and their parents will tell all their friends about your school. Our schools have done exceptionally well in our retention efforts, keeping some 80-90 percent of our students. How do we do it? I am going to share a few of our secrets here. Make your students feel welcome. The TV show Cheers showed how important it is to give people a place to go “where everyone knows your name and everyone is glad you came”. Smile as your students walk in, say hello, and try to remember their names when possible. Ask them how they are doing. Thank their parents for their business and their hard-earned money. Make everyone associated with your business feel valuable, but especially your students. 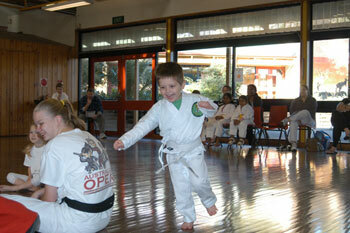 Create excitement and energy in your martial arts classes. Make every class as memorable as the first one. The classes should be fun and interesting. Although reviewing our required techniques is essential, each class should include something different from the week before. Do a fun game near the end of class to leave the children pumped when they leave. They won’t be able to wait for the next class. Be enthusiastic, your students will feed off your energy. Ask questions often during the classes to get your students involved and to keep their interest. Ask for volunteers to “model” techniques before the whole class. This really keeps the kids motivated. Keep the classes moving. Don’t bore children with long-winded, detailed explanations. Let them learn by doing. Engage with and listen to your students. Get to know your students. Watch closely for signs of disinterest or lack of enthusiasm. Talk to them and find out why. It could be that the student is discouraged because they are not getting a technique or kata. Offer them extra help. Or they might not be getting enough of your attention. Try to find something they are doing well and praise them for it. Let them know you think they are important. Ensure the classes are friendly and safe. Do not let children spar until they are ready. Make sure proper protective equipment is used and watch the student’s control, especially with the less experienced students. With new students, be especially supportive. Most are feeling clumsy and awkward, so give them plenty of praise and recognition to get through this stage. They will gain confidence quickly. Put yourself in your student’s place. I initially thought a little girl was putting little effort into her classes, and was about to talk to her about it. But when I observed her playing a game in class it occurred to me she had a physical problem that prevented her from running fast or coordinating her little body. Her mom confirmed she had a severe muscle tone problem. I put myself in the little girl’s place and cut her some slack. Put yourself in their parent’s place. Treat your students like you as a father or mother would like your own children treated. If you make a mistake, sincerely apologise to the parent and child publicly. People will respect you for it. If you say you are going to do something, do it. If you tell a student you will grade them Tuesday of next week, be ready with the certificate and belt when the day comes. Failure to do what you say will cause your students to lose respect for you. Treat all students and parents with courtesy and respect. There is no such thing as a “dumb” question or comment. All questions deserve a prompt, polite answer. Ask students why they are quitting. Many students will quit for reasons beyond your control. Students move, they sometimes cannot afford to pay the class fees, the classes clash with school or a school-related activity, or they simply lose interest. When students quit, ask them the reason if possible. This might help you discover problems that you were not aware of. Use this as a learning tool to make your classes better. 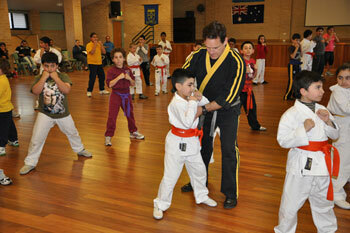 Although is article is directed towards martial arts for kids, it will work for any age group. Implementing just a few of these suggestions will see your retention rates skyrocket. Instructors or assistant instructors, do you have any ideas to help retain your students? Sparring is fun, as long as it's closely supervised and safety rules are enforced. Twack!!! I gasped as his foot landed squarely in my stomach. As I stumbled backward I tried to catch my breath, but the wind was knocked out of me in one painful instant. Regaining my breath I threw myself straight at the tall, lanky green belt. In football we were taught to take on our attackers head-on and plant them on their backside. He didn’t play by my rules and it was clear I was no match for his skill and footwork. He sidestepped me and caught me with a ridgehand strike to my right eye, sending me to the mat. I had enough. It was not supposed to be like this. Sparring had just started two minutes earlier, when the sensei said “I’m just going to duck out for a cup of coffee, you boys be careful and go light”. So much for his advice. As a white belt with five blue belts and two green belts, I was the seal in a pool full of sharks. At 19, I just learned my first lesson in how not to run a karate school. Never allow students to spar without supervision, and never allow untrained students to spar unless they are ready. Sparring between strangers can be especially dangerous as no one knows what to expect, and therefore everyone goes out hard. Fortunately for me at the time, I was still in the 30-day trial period, so needless to say, I never went back to that school. The sensei’s carelessness cost him the $50 per month I was getting ready to pay for six months in advance. That was a lot of money back in 1979 and I’m certain I was not the only one that walked out during the trial period from that school in Sacramento. Later on I would learn of other mistakes this school made. No protective equipment was used by any of the students that day. The head gear, gloves, shin guards, mouthguards, and groin protectors that are required by reputable schools of today were not used by this school. The idea was that everyone would “control their techniques”, but no one did, especially in the absence of the sensei. No striking (kicks or punches) in the face. No striking below the belt. No striking in the back. No striking the head with full contact. Hitting the front torso is okay, provided it is with light contact. For the head, the contact should be very light, or no contact, and should only be to the area protected by the head gear. Sparring is allowed only in the presence of an instructor. Students who show excessive contact consistently or do not follow the rules are to be removed from sparring until they are able to do it safely. Students should never be forced to spar with anyone. They should be allowed to refuse to spar anyone who is training without proper control or care for others. 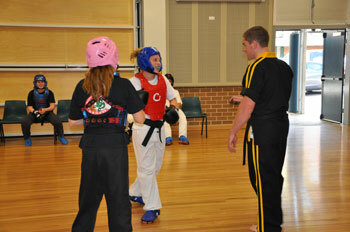 Sparring is about building self defence skills in children, and improving their confidence. It is extremely important to introduce them gently into it. Sparring can be very scary for a child, especially the first few times. After this, kids will realize how much fun it can be, provided it is done safely. What are your experiences with sparring? Kids birthday parties are meant to be fun. Karate is meant to be serious. Years ago when I started my kids karate business, I provided the “entertainment” at a birthday party for a student of mine, whose mother requested it. I use the word entertainment, because that is exactly what it is, nothing more and nothing less. I did my best to keep the kids’ attention as we went through the blocks, strikes, kicks, and karate games. It was mass chaos. Kids were running through the “class”, throwing things, jumping the queues, and mucking around in general. What do you do at a birthday party if the kids won’t listen, won’t behave, and don’t care? Do you sit them down? It is not appropriate at a birthday party, as they are there to have fun. Just the same, what if some child got hurt because of the horseplay? Karate is not entertainment. It is serious business. Although we make our classes fun and exciting, we try to impart to the students how important it is to be serious about their training. As I tell my students in our classes when they need a bit of a “settling down”, what they learn in karate class may someday save their lives. It is next to impossible to convey this to a bunch of kids at a birthday party. 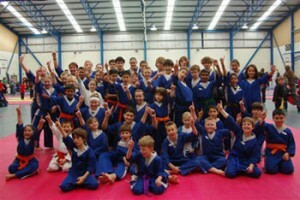 Some martial arts organisations use birthday parties as a revenue raiser, and also as a way to build business through the referrals of children at the venue. The theory is that the kids will see what fun it is, and join the regular classes. I tried it again at a later party, in the hopes that the first experience was an anomaly. It was not. Same experience the second time around. I think we gained one student from each party. After that, I told myself I would never do it again, and many years later, have never regretted it. I am aware that many of my competitors in the business provide this service. For me, I am happy to put my time and energy into my students who are serious about the martial arts and are in it for more than just “entertainment”. 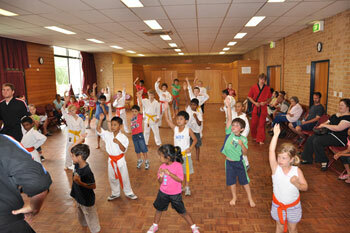 What is your experience with kids karate parties? Strength training can help your child perform better in the martial arts, if done safely and with proper form. Can children improve their performance in martial arts through strength-training? Most definitely! The martial arts require powerful, explosive movements. Strength-training exercises can be very effective in developing this explosiveness. Sprinters, football players, basketball players, baseball players, and many other elite sports people now use strength-training as an important part of their preparation. Gridiron (American football), like martial arts, is an explosive game. As my high school coach fondly put it “It’s all about five yards (meters) and a cloud of dust”. You need to explode off the mark, hit the line hard–BOOM!, and drive. Power, strength, and speed is everything in this collision sport. We were encouraged to lift weights from 9th grade (13-14 years) onward. I am not sure if it was the result of natural growth or the weight training, but the gains we made in strength, speed, and power were astonishing. And the increase in our self-confidence was just as dramatic, as we got bigger and stronger. Is it safe for kids to lift weights? For years, many so-called experts said weight training and other strength-training exercises were not safe for children. “It will stunt Jimmy’s growth”, they said. I believed this myself for a long time. Today, top research authorities say that is not the case. Many reputable medical and sports organisations, including the Mayo Clinic, American College of Sports Medicine, National Strength and Conditioning Association, and the American Academy of Pediatrics now support strength-training exercises for children, if performed safely. They also list many benefits. What are the benefits of children doing strength-training exercises? Increased muscle strength and endurance. Helps to protect the child’s muscles and joints from injury associated with other activities. Help your child maintain a healthy weight. An exercise habit which lasts a lifetime. The concept of goal setting. Strength-training is just as if not more important for young females, as females are at an increased risk of osteoporosis. Strength-training increases bone mass, which prevents osteoporosis. It is even more important for females to start strength training as it builds stronger bones. How do we make sure it is safe and effective? As early as 8 years old, children can benefit from a strength-training program, provided they are mature enough to follow directions and perform the exercises with proper form. It is wise to check with the child’s doctor to make sure there are no health problems that would prevent them from participating in the activity safely. Heart conditions, high blood pressure, or seizure disorders are examples. For kids, light resistance and controlled movements are the key, with emphasis on proper technique and safety. Your child can start with exercises using his or her own body weight, like lunges, push-ups or pull-ups, and work slowly into light weights. One to two sets of 12-15 repetitions is ideal for children. The number of sets and the amount of weight lifted can be gradually increased as the child gets older and has mastered proper lifting technique. 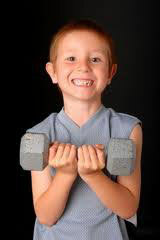 Lifting heavy weights like power-lifters and bodybuilders is not advisable for children. This can put too much strain on tendons, muscles, and growth plates—especially when performing the lift without proper form. Lifting to muscle failure is also not recommended. Bulking up is not advised until after puberty. If the child cannot lift the weight at least 10 times, the weight is too heavy. Find a coach or trainer that is knowledgeable about youth strength-training. They will be able to design a program based on your child’s size, age, and sport-specific requirements. Child-sized weights and equipment are good if they can be found. Adult supervision is an absolute necessity when children are lifting weights. Warm up properly before any weight-training session to prevent injury. Lifting the bar without weights on it is a very good way to warm up. Make sure your child rests at least one full day between workouts. 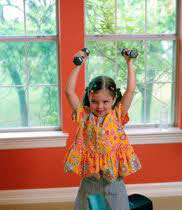 Two to three days a week is enough for a child’s strength-training program. Keep it fun and interesting by varying the program, or your child will get bored. Results take time. Set realistic goals with your child and encourage him with praise and rewards. If you push him it will soon become a job and he will quickly lose interest. The decision to begin and continue a strength-training program should rest solely with the child—not with an overzealous parent or martial arts coach. With a properly designed and supervised strength-training program, your child can build strength, confidence, and perform better in sports. It might be the edge they need, not only in the martial arts, but also in life. 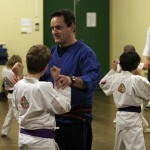 Sensei Matt Klein "Teaching kids karate is the best job in the world". I recently sat down and thought, how lucky am I to have a career I love. I sat down and wrote out all the reasons I am grateful. It is a great exercise; I recommend it highly. I am truly blessed, and grateful. Here’s why. I like kids. From the very first moment I put on my gi and started helping kids with their karate, I knew I found my calling. The little ones followed me around, asking questions, showing me their moves “that they made up”, while laughing and smiling the whole time. Kids are fun. How could you not like them? I like the social aspects. I like the sense of community that we have in the karate world. The black belts, who started as kids, and who are now instructors; the parents who have been there supporting their kids and our program for years; the many friendships that have been built in the karate dojo; the jokes, laughs, and “inside information” we all share; this is what builds a great community. Keeps me fit. As any mother or father can attest, trying to keep up with the kids can take some serious energy. Let’s face it. We all like to eat, and we all like to relax. I like my food–did anyone say “chocolate”? I enjoy surfing the net and reading other people’s blogs—while sitting down. Without this job to get me up and about, who knows how unfit I would be. Keeps me young. Kids have a different way of looking at things. The way they talk, the positive way they think (some day they are going to be Superman! ), the way they don’t really care how they look when learning new things. How they just start playing a game and everyone is invited, the more the merrier. The wonder of the world around them. Just being around it keeps a person young at heart. I get to play games, have fun, and sometimes act like a kid too. I like to challenge myself to be better. When I see one of my students perform a kata brilliantly, it inspires me to be better. When I go to a karate tournament and see a guy ten years older than me doing something amazing, it makes me want to do better. I like how everyone around me is constantly lifting their game, which makes me want to do the same. I am passionate about martial arts. Since the day I walked into my first karate class, I knew I was in it; hook, line, and sinker. Writing down all the moves so I would not forget them, practising almost every day, jumping into the tournament scene, even dreaming about martial arts; I could not get enough. This has not changed one bit, even after half a lifetime. I am jazzed about what I do and look forward to each day. Those that know me well are aware that I am a bit of a “night bird”, but when I get up in the morning I am fired up and ready to tackle the day ahead. I cannot wait to “get at it”. I feel like I’ve accomplished something at the end of the day. When I get in my car at the end of the day, I smile knowing that we did something truly amazing. We built up the confidence and self-esteem of youngsters, and helped them to build better lives for themselves. For me, it is the best job in the world. 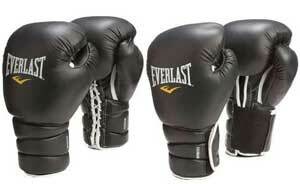 Problem: Four boxing gloves, three kids. Funny how kids are attracted to boxing gloves. We had a big problem. Only two pairs of gloves and three kids, and nobody wants to sit out, because it’s boring. We immediately went to work putting on our thinking caps. Bingo! I put on one pair and the other two kids (my brother Joe and one of my best childhood friends, Mike) put on one glove each. I had to run between them as they tried to hit me, all the while throwing punches in return. We played this game for hours, laughing, pummelling each other, trying to avoid the furniture, and screaming the whole time like wild animals. I think back on these times fondly, even though I think I lost most of the exchanges. My poor parents. Secretly I think they were happy though, because it kept us occupied and out of trouble for a long time. We figured out how to walk like ducks, mimicking their quacks, and then used it in real life—to make fun of our poor sister, Kim. Looking back on it, we laugh, even Kim. We spent hours building tracks in the dirt and then flew around them on our sting ray bikes, sliding into the turns, jumping over the humps; inevitably crashing, necessitating a crying session in mom’s arms for pity. If you watch kids long enough, you’ll see how they use their creativity to solve their biggest problem—how to have fun. When it comes to play, when there is a will, there is a way. We adults can learn a thing or two from them.